CelebriDucks and Rubber Tubbers are joining forces to create cutting edge sports promotions for the NCAA, NBA, NHL, and Major League Baseball using celebrity rubber ducks and collegiate on field mascots floating on inner tubes. 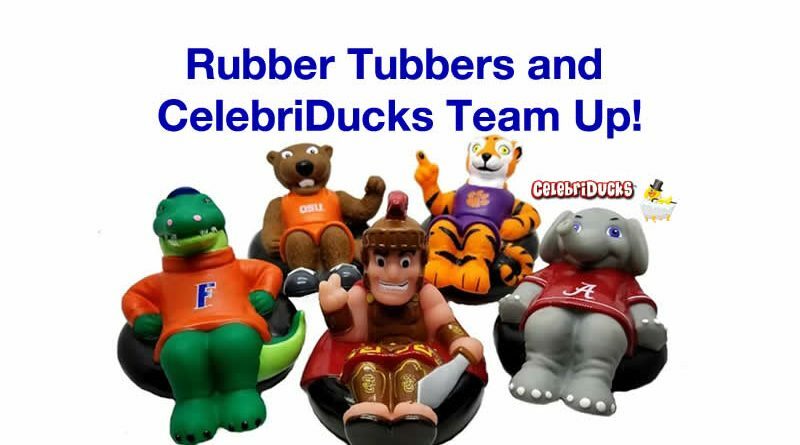 CelebriDucks, a manufacturer of premium celebrity rubber ducks has partnered up with Rubber Tubbers to create the first ever line of licensed collegiate on-field mascots floating on inner tubes. The first releases were USC- TOMMY TROJAN, Alabama-BIG AL, Clemson-THE TIGER, Florida-ALBERT, and Oregon State-BENNY BEAVER. This Summer they are adding Auburn-AUBIE, FSU-CIMARRON, Georgia-HAIRY DAWG, Kentucky-SCRATCH,and Tennessee-SMOKEY. They are expanding the line to include not only collegiate mascots, but team mascots for the NBA, NHL NFL, and Major League Baseball. CelebriDucks is best known for their line of celebrity ducks including The Wizard of Oz, Elvis Presley, The Blues Brothers, and KISS among hundreds of others. The company created a Tropical Parrot for The Jimmy Buffett Margaritaville Cafés, and successfully sell their Blues Brother’s ducks at all House of Blues venues nationwide. They have sold millions of ducks and are considered the top custom duck manufacturer in the world doing them for everyone from Harley-Davidson and SeaWorld to The Jersey Boys on Broadway. ← Disney’s Boat House Features CelebriDucks!